I would either live with the hole, or modify the crossover as I sugggested to make it smaller. I wouldn't lay the speakers on thier sides or move them down or anything else like this. Your creating bigger problems than the one your trying to fix. Thats audio for you, people get fixated on a small problem and create bigger problems trying to fix the smaller one. I see this over and over and over again. When one has no idea how to "scale" the problems in terms of audibility then this is inevitable. Hey I didn't know it was a problem until someone else mentioned it. Admittedly the term hole had me a bit nervous. I am finding there to be a pretty large difference in tonality with varying degrees of vertical axis. In other words, the stand up sit down test creates very noticeable differences, and so I would think having the speakers on the floor pointing straight ahead would cause it to sound tonally different from the left and right speakers. Correct, which is why I wouldn't do it. Keep the three fronts at the same level and then change the crossover for the center if you notice anything, but you have to be dead on center. The crossover change will degrade the power response, but improve the axial response. Which is better for you depends on the room and the setup. It's probably time I give an update about my experiences thus far with the Nathan 10s. I've had them up and running for two months now and I'm still loving them. Placement in my room is not ideal. 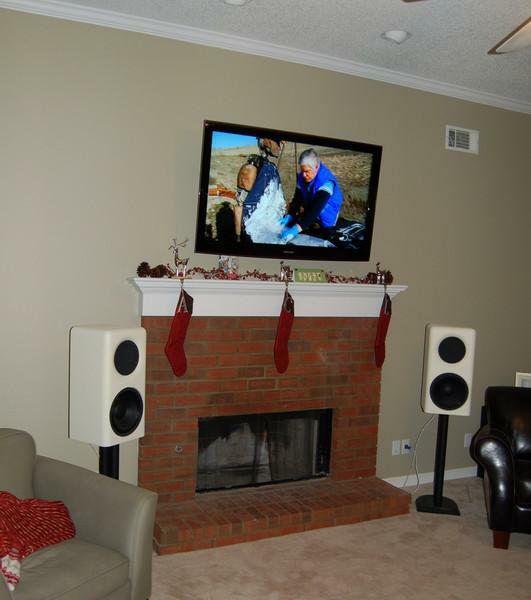 The speakers are only 20" off the front wall and my listening position is near the back wall. Unfortunately this is not something I can change easily due to big entryways on two walls and a doorway to the kitchen on another. The Nathans sit on either side of my fireplace, with my TV hanging above the mantle. The Nathans are about 7-8 ft from each other and about 5 feet from the side walls. They sit on stands that bring the midpoint between the waveguide and woofer to ear level. Below is a picture from shortly after I set them up. They are currently toed in slightly more than they are in the picture and I pulled forward to get them away from the front wall and moved the leather chair away a bit. They are now at exactly 45 degrees toe in, which puts the crossing point about 4.5ft in front of the center listening position. My main source is the optical output of an airport express being fed music from my Mac Pro. Secondary source is my blu ray player. Receiver is a Denon 2809ci. Subwoofer processing is handled by a DCX2496 and a DEQ2496. Subwoofer is a Maelstrom X in a 6 cubic foot sealed enclosure, powered by an EP2500. Probably worth noting that my crossover uses the 1.0uf cap on the compression driver. Only mods I did to the speakers were using a Speakon connection on the rear panel and increasing the roundover to 1.25" radius. The system sounds fantastic. I think I've used the word effortless before to describe them and that still holds as my primary description. Sometimes I play certain music at pretty high levels (wife calls it "rocking out" ) and these speakers never even flinch. They sound absolutely fantastic at levels I've never even dared to try with my previous speakers. I'm also a sucker for good female vocals and these speakers do not disappoint. My favorite tracks from Natalie Merchant, Rosie Thomas, Neko Case, Diana Krall, etc. all sound wonderful. Karen O from the Yeah Yeah Yeah's just makes me grin ear to ear on the Nathans. That sort of music, epitomizes the strengths of the Nathan 10s in my opinion. Hard rock power but such a pleasing response that never sounds harsh. They seem to fit perfectly with the full range of my music collection. The imaging is perfect, as long as I have some absorption panels in place on the front wall and directly behind my head on the back wall. I hope to make the panels permanent in the next few weeks but my wife and I are still discussing how to do so and maintain some reasonable aesthetics. I'm experiencing the same effect that has been described previously as a result of the speakers crossing in front of the listener. The response seems very even as you slide along the couch between the speakers. Sitting on the front of my coffee table, at the intersection of the on axis paths, is a pretty interesting sound, but not as good as the listening position. In all seriousness, this is the happiest I have ever been with a pair of loudspeakers. The work I'd like to do going forward is with the room itself and the addition of a couple infinite baffle manifolds. I had 3 subs in the room, but my wife eventually said 2 had to go. The IB manifolds suit her just fine because they will be effectively invisible aside from a couple extra air return grates. Taming the early reflections off the front wall and the reflections off the wall behind the couch really does make a lot of difference, so that needs to be made permanent in the near future as well. Thanks again to Earl for making these available to us. It really has been a great experience. The GR surround looks interesting, also worth looking at for the clever mounting. A small group listened to various combinations of surround speakers and gave their impressions. It was a blind test where the subjects were "normal people" ie not audiophiles. This is unrelated to the waveguide kits, but could be an option for the subwoofer kits. A bandpass sub designed to be hidden and with the port made up of a flexible tube that connects to an air vent. I believe James loudspeakers and Speaker Craft have done this, and I think it's a somewhat ingenious idea. The flexible port needs to be something where the length can be kept constant, but otherwise I don't seem major problems in implementing this in a kit or diy. I think it has the potential to be a better idea than the IB manifolds since they should be cheaper to implement and more efficient. I have Summas and I am jealous of how small your speakers are! Even with a dedicated listening room thats the size of a small apartment (600sf), it's tough to arrange the room around the Summas. I heartily recommend getting lots of subs - I started with three and now I have eight. It's the biggest improvement you can make IMHO. Even a Danley DTS-20 would have a hard time keeping up with the Summas, you really need some serious subwoofers to keep up with the mains. Glad to hear you like the new system! If anyone doubts that such a huge speaker can "image", here's something funny that happened this weekend. Here's the episode, if anyone saw it, it was the scene with Sun, Jack, Ben, and Sayid. P.S. A question for Earl. When do you expect the Harpers to be available ? I think i have a couple of potential customers and want a pair myself. Give me a week to finalize the prices and then I'll start taking orders.